The latest generation of the worlds best-selling music notation software, Avid Sibelius 7 is sophisticated enough to meet the demands of top composers, arrangers, and publishers, yet simple enough for beginners and students. Work quickly with the brand-new, task-oriented user interface. Experience your scores in stunning clarity with our exclusive, professional-quality sound library. Collaborate more easily thanks to full MusicXML interchange support and other sharing options. 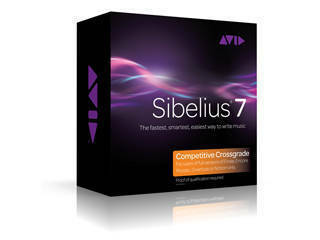 With all these advancements and many more, Sibelius 7 is the fastest, smartest, easiest way to write music. The brand-new Sibelius 7 user interface provides task-focused tabs that lead you through the process of creating a score from start to finish. Every feature has both an icon and a text descriptionwhich you can access via a button or a keyboard shortcutwith full contextual help available when you need it. You finesse every detail of your scoreyou want to hear every nuance during playback. Sibelius 7 includes more than 38 GB of professional content, including a specially recorded symphony orchestra, rock and pop instruments, and much more. This exclusive sound library is only available in Sibelius 7. Todays 64-bit capable hardware and operating systems provide big speed and memory advantages. Sibelius 7 is the worlds first 64-bit notation software, enabling you to unlock the full power of your 64-bit systemand work more quickly, with more virtual instruments and effects, than ever before. We understand that many of our customers favor laptops or other single-display systems. Thats why we designed the Sibelius 7 interface to allow you to focus on the music at all timesand easily hide information that you only need to see occasionally. Theres never been a better time to switch from Finale to Sibelius. Sibelius now features a step-time note input method that is very similar to Finale softwares Speedy Entry methodright down to using many of the same keystrokes. So if you know how to input notes in Finale, you know Sibelius too. And because todays workflows include a wide variety of software applications, Sibelius 7 now includes full MusicXML export capability, so you can exchange files with hundreds of other applications, including Finale. Take advantage of the latest OpenType fonts, including advanced features like ligatures, and employ them in text frames with full DTP-level capabilities. Theres no need to export projects to a separate DTP applicationnow you can complete many of them within Sibelius 7. Sibelius 7 makes it easy to import graphics in all major formats, then manipulate them to build complex layouts for publishing, creating teaching materials, instructional books, and more. You can export the full score as publication-quality graphics in PDF format, plus individual pages or smaller sections in EPS, PNG, and SVG formats. Its never been faster or easier to finish the job to the highest standards. Sibelius is the fastest, smartest, easiest way to create and edit musical scores. Sibelius delivers revolutionary, time-saving features like Magnetic Layout and Dynamic Partsplus a powerful creative toolset including Flexi-time MIDI input, Keyboard and Fretboard windows, and a variety of other input options. With all this functionality and more, Sibelius empowers you to create incredibly complex scores quickly. In addition to creating and editing, Sibelius makes it easy to play back your scores with stunning realism. The massive included sound library gives you immediate access to a wide range of professional-quality instruments. If you want even more great sounds, Sibelius supports VST and AU plug-ins, giving you access to third-party sample libraries. You can also sync Sibelius with other popular audio softwaresuch as Pro Toolsvia ReWire.